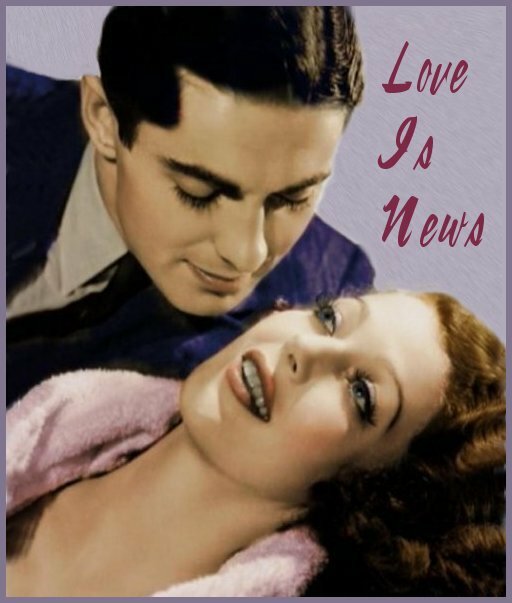 Tyrone Power's first starring romantic comedy starring role was in Love is News with Loretta Young, who had earlier played opposite him in Ladies in Love (where Ty's role was a relatively small one). Love is News would make them a very popular team. Also starring in Love is News was good friend and frequent co-star, Don Ameche. Ameche had also been in Ladies in Love, in a larger role than Tyrone's. Later, he and Ty would appear together in Alexander's Ragtime Band and In Old Chicago. George Sanders had a supporting role in this movie, as Count Andre de Guyon. He appeared with Ty in Lloyds of London, which was Ty's first starring role, and Solomon and Sheba, the movie in which Ty collapsed with a heart attack during a duel with George. He also appeared in two 1942 movies with George - The Black Swan and Son of Fury . Eleven years after Love is News was released, 20th Century Fox remade the movie, with slight variations into a movie called That Wonderful Urge, with Gene Tierney assuming the role of Ty's leading lady. That Wonderful Urge was the last romantic comedy that Ty made, though his performances in comedy were usually very well received by audiences. Oddly enough, Ty's first starring role in a romantic comedy (Love Is News ) and his last (That Wonderful Urge ) were, essentially, the same story. Ty had a very natural talent for light comedy, and he enjoyed doing it. Why Darryl F. Zanuck didn't use him more in this type of film has been questioned by critics and other filmmakers. Of course, Ty was excellent in other types of roles where, perhaps, it would not be so easy to fill his shoes. No one was a better swashbuckler, for instance, than Ty, or better at romantic drama. Ty's try at light comedy was very well received by fans, as well as by critics. Among the comments from critics: New York Herald Tribune: "Tyrone Power justifies the promise he showed in Lloyds of London. Even though he is involved in absurd proceedings, he keeps characterization solid and appealing and makes the romance palatable.. Endowed with a gift for make-believe as well as good looks, he should have little difficulty in becoming Hollywood's leading juvenile idol." New York American: "Tyrone Power demonstrates that he needs no costume buildup to cause the customers to take notice." Variety: It's nutty, illogical and impossible, but Love Is News is grand fun and Power, in his first major assignment since Lloyds of London and, in a much lighter spot, impresses again. He is believable as a reporter, even if some of his antics are not. Belafonte, Dennis. The Films of Tyrone Power. Secaucus, N.J.: Citadel Press, 1979.